If you live in the snow belt long enough, you will experience this problem with your lawn from time to time in the spring: patches of discolored grass, either straw-colored or matted with a white or pinkish web-like coating that appears in the early spring. It appears as the snow cover begins to melt and may continue to thrive and spread as long as the weather is cool and damp. Usually, the discolored spots begin to shrink as the weather becomes hot and dry, but in rare years that are cool and wet, the spots may persist through the summer and into the fall. This is snow mold—a lawn disease caused by two principle fungal culprits: gray snow mold (Typhula spp; also known as Typhula blight), and pink snow mold (Microdochium nivalis, also known as Fusarium patch). As the names suggest, gray snow mold shows a white-to-grayish webbing to the infected areas, while pink snow mold is grayish to pink. The fungi remain inactive in the soil in the form of resistant fungal structures or spores, easily surviving high summer temperatures but not actively growing. The spores or fungal structures launch into active growth beneath snow cover in the late winter when the temperatures beneath snow cover range from slightly below freezing to about 45 F. When snow cover melts, the active fungal infections will continue to thrive and spread until surfaces dry out or temperatures are steadily above 45 F. Pink snow mold is slightly more tenacious, growing actively as long as the lawn is moist and temperatures are between 32 F and 60 F.
It's not likely you will face snow mold every year, but if you watch closely, you will notice that it's most pronounced in those springs when the first snows months earlier were early and heavy enough to cover ground that wasn't yet fully frozen. When additional snows continued to fall, the warm ground beneath the snows was actively harboring fungal growth, and you are faced with the results when the spring thaw comes. A cold winter without much snowfall is less likely to produce snow mold damage in the spring. Though the fungal spots you discover in the spring are unsightly, they are usually not very serious. 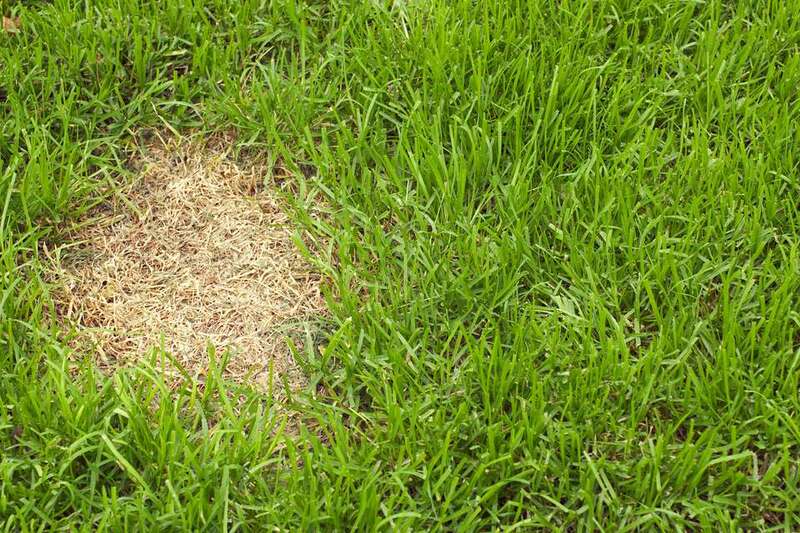 As the weather warms up and the lawn dries out, the infected areas will gradually green up. Rake the damages spots gentry to aerate the grass blades and help dry out them out. Remove any thatch layer that is more than 1/2 inch thick. This should not be done until the lawn has dried out somewhat and has been mowed two or three times, as mechanical dethatching machines can badly damage new grass shoots in the spring. Mow the lawn at a shorter than normal length until the mold is no longer actively growing. Taller grass will hold more moisture, which fosters fungal growth. Especially in the fall, mow to a short height to minimize the moisture that might be trapped under the first snowfall of the season. Bagging up all grass clippings for the last few mowings in the fall will also help. Rake up leaves in the fall. This, too, will reduce the trapped moisture that can trap moisture. Don't apply nitrogen fertilizer in the fall. While fertilizer manufacturers like to recommend a fall application of "turf builder," if you have habitual problems with snow mold, avoid fall fertilizing of the lawn. Avoid heaping large piles of snow along walkways and driveways. Spreading out the snow will help it melt quickly in the spring rather than holding moisture during the prime fungal growth periods. If the damage is severe, over-seeding the bare spots in the last spring may help. Remember not to fertilize or mow these seeded spots until the new grass is vigorously growing. Avoid using fungicides if possible, but if your lawn infections tend to be severe, you can apply a preventive spray of thiophanate-methyl in late fall, just before the first expected snow.